New data from the Wisconsin Hospital Association show that the federal health care reform law has had the desired effect of causing a sharp drop in uncompensated care. That’s great news because much of the cost of uncompensated care for people who are uninsured gets shifted to other patients and contributes to higher rates for people with insurance. The sharply reduced spending for uncompensated care – which in Wisconsin is defined as the total of charity care and bad debt –also has the benefit of creating a great opportunity for hospitals to make upstream investments that promote public health and alleviate some of the factors causing severe health disparities. 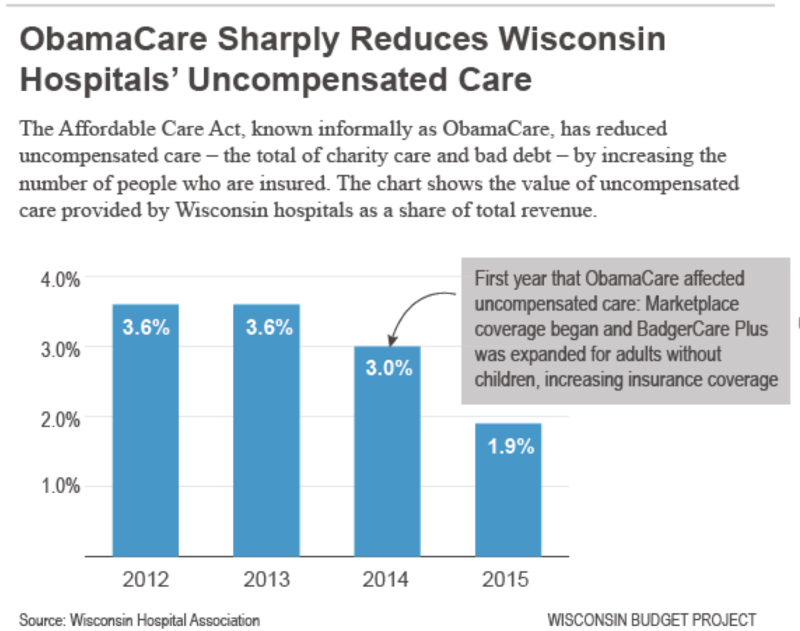 The new data and the following bar graph demonstrate that uncompensated care expenses have dropped precipitously since 2013, as key parts of the Affordable Care Act (ACA) were being implemented – including the new insurance Marketplace and Wisconsin’s partial expansion of Medicaid coverage for childless adults. In 2015, which was the second year of those important changes, uncompensated care in Wisconsin fell to 1.9 percent of patient revenue, compared to 3.6 percent in 2012 and 2013. That’s a two-year drop of about 47 percent. The monetary value of uncompensated care in Wisconsin (measured by billings) fell by $534 million from 2013 to 2015, a drop of 36.8 percent. That sharp decline is almost the same as the 37.6 percent drop in uninsured Wisconsinites. The close correlation between those measures is one of the reasons why state policymakers should not be satisfied that there are still about 323,000 uninsured people in Wisconsin. As I noted in a recent blog post about the policy choices lawmakers face next year, our state still has some work to do to catch up to two neighboring states with lower uninsured rates. If we reduced our 5.7 percent uninsured rate to the 4.5 percent rate in Minnesota, there would be almost 70,000 fewer uninsured Wisconsinites! State policymakers could achieve that goal by removing administrative barriers to participation in Medicaid and by taking advantage of the federal funding that would pay the full cost of expanding Medicaid eligibility for adults to 138 percent of the federal poverty level (FPL). A study released in June found that uncompensated care in the U.S. fell by $6 billion in 2014 alone, and almost all of that improvement came in states that expanded Medicaid for adults. In those states uncompensated care fell by 35 percent, compared to just 1 percent in the “non-expansion” states. Wisconsin is included in the latter group, but unlike the other states that have turned down ACA funding for expanding Medicaid, Wisconsin makes all adults below the poverty level eligible for Medicaid. That partial expansion (to 100 percent of FPL rather than 138 percent), helps explain why Wisconsin accounted for more than half of the net drop in uncompensated care in non-expansion states, even though Wisconsin’s improvement in 2014 was well behind that of the Medicaid expansion states. Although I think the drop in uncompensated care is great news, it also needs to be noted that nonprofit hospitals, which don’t pay income or property taxes, have both a legal and moral obligation to help people in need in their communities. In light of the very substantial reductions in charity care in Wisconsin and elsewhere, hospitals have a wonderful opportunity – as well as an obligation – to find other ways to help meet community needs. The savings accruing to hospitals from the ACA should enable them to help achieve another objective of health care reform – an increased emphasis on addressing population health issues, including the social determinants of the glaring disparities in health outcomes for low-income families and particularly for communities of color. Some hospitals have begun to make investments that can help alleviate those disparities, but I think that’s an area where health care providers need to be investing far more resources, and it’s an area that also merits more attention from policymakers and advocates.